The number of mobile apps has increased significantly in the recent years. The app market is huge and it is expected that the app market will cross $80 billion by the end of 2018. The prospect of trying a new app excites the users, especially when they change their old device. As a result of this, leading app stores are teemed with billions of apps with an overwhelming number of downloads every year. This shows that mobile app industry has a lot of potential and numerous companies want to tap into this potential. More and more companies want to launch unique apps with the best functionalities. App development is in golden age now and many app developers are trying their best to create the next big app. If you are an entrepreneur in mobile app industry with a great App Idea, then you must not only implement it successfully, but protect the idea from being stolen. Now, the question is how to protect the app idea from being copied. Anyone who gets hint of your idea can copy before it is published. Here are some effective ways to protect your app idea from pirates. Building the app immediately is one of the best ways to protect your app idea. Turn your idea into app as soon as possible without revealing much about it. Once you have developed the app, you can have copyright protection toprevent reverse engineering. Make sure that the freelancer or mobile app development agency is releasing copyrights to you at the end of the project. It means, the intellectual property is your – once you have paid the bill. If we see technically, the app belongs to the app developer. However, once they are paid off – the app belongs to you. Non-disclosure agreement is one of the crucial steps taken by any business to protect their property. The same is the case with mobile app development. When you are hiring developers or designers for your project, you should ask them to sign a non-disclosure agreement. You can get this done with the help of an attorney. Similarly, non-competent agreement is aimed to keep people from revealing secrets of the company to competitors. It refrain developers who are working on your project from working with other companies. The best thing about non-competent agreement is that the professionals will not work on your competitor’s projects. However, it is a bit difficult to find developers who are willing to sign such agreement. Getting into non-disclosure and non-competent agreement is the best way to protect your app’s idea. Apply for patent of your app to protect your idea. However, it is not an easy task. You apply for patent application and it takes more than 2 years for issuing app patent. Once you have the app patent, all you need to do is protect the functionality of the app. You must also protect the app against independent development. Before you make public announcement, file all the important information with the help of your attorney. The only drawback of applying for a patent is that it is expensive. Before you file patent application, you can ask yourself – is the app really patentable? Your invented app should be really new and beneficial. Patenting the app will cost you more than what you invested in developing and implementing the app. To overcome this issue, you can apply for provisional patent that protects your app idea for a year. Even if your app idea is not valuable, you will have time to improve it. 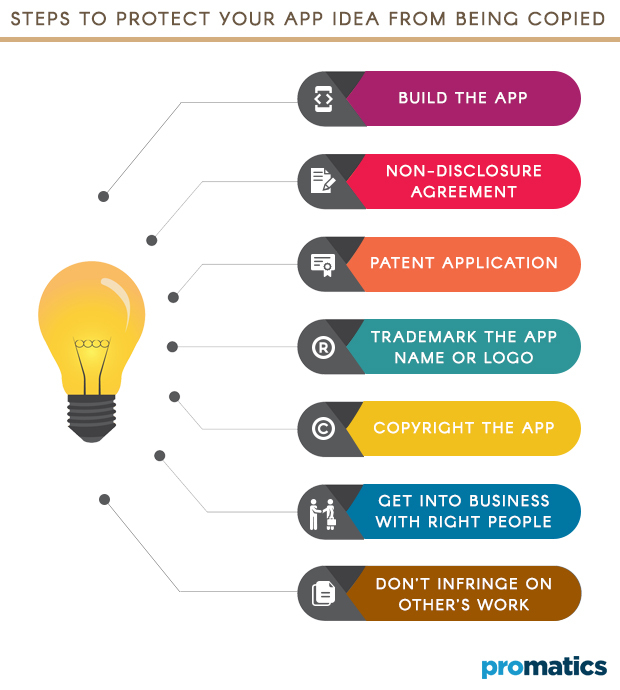 Trademarking the app is another effective way to protect your app idea from being copied. This method helps you restrict other developers or entrepreneurs from using the name, icons and logo of your app. Besides these, you can even trademark the features and functionality of your app. This method will surely prevent your competitors from following the same route. If we have a look at the top-rated apps like Angry Birds, Instagram, and Candy Crush etc – we can say that their brand recognition is highly incredible. These apps can be identified just by seeing the font and colors that are associated with them. The best part about trademarking the app is that your competitors or other developers can’t trick potential customers by creating products with similar logos or names. Trademark also offers extra protection against legal issues. You can take help of a reputed lawyer who is aware of the tricks and guide you accordingly. Copyright is one of the popular terms we hear, when it comes to protect the property, product or service. However, you cannot copyright the idea – as it is limited to code, design and UI. Copyrighting the mobile app is cost effective and provides basic protection against direct copiers. You can file copyright protection online. However, it does not protect your ideas or methods – unless they are implemented in a creative way. Copyright will help you protect the original work such as source code, graphics, text and AV content. This process is quite cheaper compared to trademark and patent. One of the common mistakes that business owners do is to get involved with the wrong people. It is always advisable to do business with those whom you know very well. Find if they have a good reputation of working on similar clientele. You can easily run a background check of the developer, client, investor and even contractor before involving them in the project. Selecting trustworthy people will help you to turn your idea into great app. Moreover,you can decide how much information to reveal to other so that the app idea can be protected. Most of the times, we are inspired by the work of other people and try to copy it. The same is the case with app development. Though you have your own ideas and concepts, you end up trying something that is popular at that moment. The best way is to prevent infringing the work of others and try to keep your work as original as possible. There are hundreds of apps on App Store that are similar to the reputed apps. Whether it is gaming app or on-demand services app, you will find a few similarities between them. Instead of replicating the business model of others, try to create something original that fills the real need. There is no clear cut strategy to protect app idea from being copied. However, you can keep the above steps in mind to protect your app idea. Smart decision making practices can provide excellent protection over app idea thieves. Never under estimate the value of your idea, as all the big products start with small ideas. Want to work with a reliable mobile app development agency that can protect your app idea during development? Contact us today!